Members of the Rotary Club and Inner Wheel clubs met at a joint meeting to hear of the work of MENCAP by Marc Mcowens of the branch in Southend, who gave presentation to the members of the two clubs. Southend Mencap is a registered charity, charity number 1078686, and was formed in October 1955. The charity’s main aim is to serve the interests and needs of children and adults with learning disabilities, as well as those of their parents and carers, in the south east of Essex. Our two clubs decided to donate to the work that the Southend branch was doing and the provisions that were made for the Children and adults with learning disabilities. Many of the activiites are listed below but more information is available on their website. 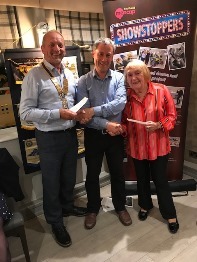 The photograph show the donation by cheque by President of Rotary Terry Tilbrook on the left, Marc in the centre and Inner Wheel Secretary Celia Ebrahimi. Southend Mencap is able to use the name Mencap by being affiliated to national Mencap but that is where the link to them ends. We are a completely independent society/organisation, are self governed and self financed. We need to seek our own funding and arrange all services and activities for the learning disabled ourselves. There is no referral system to Mencap and they do not provide us or any of the other local Mencap society’s with any income or funding. Any funding raised by Mencap never gets passed down to the local societys. · Advocacy Service – a full time advocate is available to help support the needs of the learning disabled to ensure their voice is heard when dealing with everyday issues. · Family Support Worker – a part time family support worker who provides information and support to the families of the learning disabled e.g. accessing services, benefits information. · Transitional Advocate – a part time advocate delivering the ‘Your Choice’ workshops to children with learning disabilities in several of the local special needs schools. · Music Man – daily music provision for people with learning disabilities as well as providing teaching resource and training to other organisations looking to set up their own music service. · Showstoppers – daily drama and theatre performance provision for adults with learning disabilities. · SMASH – a weekly sports club for adults with learning disabilities. · TopCats Club – a weekly social activities club on Canvey Island for adults with learning disabilities. · Music School – separate weekly music schools for children and adults with learning disabilities. · M.O.D.S – a weekly drama group for adults with learning disabilities. · Family Play & Respite – a weekly sports and social club for children with learning disabilities aged between 5 and 16 years, plus places for any of their non disabled siblings too. · 16+ Club – a weekly social club for young people with learning disabilities aged 16 to 25. · Friendship Group – a weekly social drop-in club for adults with learning disabilities. · Compatibles – friendship/relationship opportunities service for adults with learning disabilities. · TFC Mencap – in partnership with Trinity Family Centre, twice weekly morning activity sessions for adults with learning disabilities. In addition to the list of projects and activities, we also run several other events across a calendar year in an attempt to provide as much variety as possible for people with learning disabilities.